Originally posted on The Smart Set...On April 20-24, 2009, the Inuit Circumpolar Council held a global summit on climate change that brought together Indigenous delegates and observers from around the world to Anchorage, Alaska. The purpose of the Indigenous Peoples' Global Summit on Climate Change was to bring Indigenous peoples from around the world to exchange knowledge, experiences, and solutions in adapting to climate change and to develop a unified voice on climate change going into the UN Framework Convention on Climate Change in Copenhagen, Denmark in December of 2009. 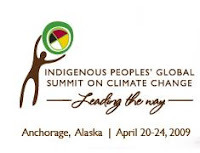 With over 500 representatives from 80 nations around the world, the summit provided an opportunity to connect the issue of indigenous rights and climate change, as well as share the wisdom of traditional and indigenous peoples around the world in adapting to changing environments.